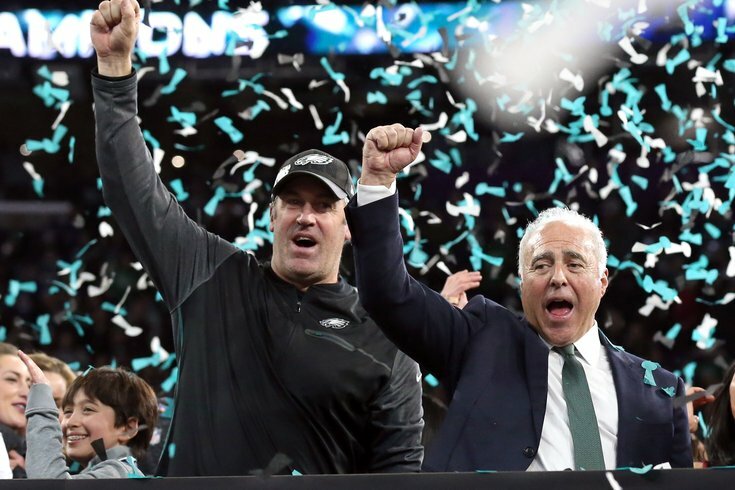 Philadelphia Eagles head coach Doug Pederson celebrates with owner Jeffrey Lurie after defeating the New England Patriots 41-33 in Super Bowl LII at U.S. Bank Stadium. Wordsmiths will find far more clever words to capture the gravity of the greatest win in Philadelphia sports history, but this is no time for fancy talk. All that matters right now is those six words up there, and what they mean. The 57-year championship drought is over. In a most improbable way, the Birds have finally prevailed. Is there a quarterback controversy between Carson Wentz and Nick Foles in Philadelphia? In fact, that's why so many fans, on the day after a never-to-be-forgotten 41-33 win over New England in Super Bowl LII, found themselves repeating that mantra - the Eagles won the Super Bowl - over and over, trying to convince themselves it's real. When I started my WIP radio show this morning, I realized quickly that there are special events that defy words. I had rehearsed many times what I would say if the Eagles ever won a Super Bowl, but none of those expressions seemed adequate when the team actually did it. I feel the same way while writing this column today. Like so many Eagles fans, the 2017-18 team is my all-time favorite, because of the tenacity of the players and their unique connection to the fans. No group of players has ever praised their fans more, and none has ever profited more from their bond with the city. Even in Minnesota, the Birds had a major home-field advantage. What none of us could have predicted was that the Eagles also had an edge in personnel, starting with the coach. Doug Pederson didn't call a good game at the Super Bowl; he called a brilliant one. Remember when he was branded "unqualified" before the season. No one will ever say that again. Everyone will recall the astonishing fourth-and goal play that had tight end Trey Burton throwing a touchdown pass to quarterback Nick Foles, but even better was Pederson's strategy in the game-deciding 14-play, 75-yard touchdown drive that won the game. The Eagles faced three third downs and one fourth down in that series, and the coach dialed up the right plays repeatedly. He never wavered in his aggression, even when his team was trailing the five-time Super-Bowl champions in the fourth quarter. If the win Sunday was the greatest in our history - I say yes - then Pederson may have just coached the best season ever in Philadelphia. And then there was Foles, an afterthought right up until Carson Wentz got hurt early in December. Foles was supposed to be nervous playing in his first Super Bowl. He wasn't. The quarterback, discarded by three teams (including the Eagles three years ago), was 28-43 for 373 yards and three touchdowns, plus his TD catch. Remember when Brandon Graham was a first-round bust? He didn't look like one when he raked the ball from Tom Brady's right hand with just over two minutes left. The Eagles' defense was awful for most of the game - it gave up an ungodly 613 yards - but when it needed a huge play, Graham provided it. Malcolm Jenkins, Nelson Agholor, Zach Ertz, Jason Kelce, Lane Johnson and even Jake Elliott will probably never have to buy another drink in Philadelphia, heroes for life because of what they did this season. "We won the Super Bowl," he said, still trying to believe it himself. "We did it. We won the Super Bowl." Maybe it's just me. All I can say is, no victory is sweet enough until I can inspect the faces of the people who lost, especially when those faces are attached to members of the obnoxious New England Patriots. Watching a crestfallen Tom Brady walking grimly to the locker room – through a blizzard of confetti honoring the Eagles, not him – was a joy, as was the glum face of his legendary coach, Bill Belichick. Up in his luxury box, owner Robert Kraft looked like he had just got run over by a truck. All three of those villains were there 13 years ago, when the Eagles flopped in the final minutes and lost Super Bowl XXXIX. Back then, Belichick was rattling off Philadelphia parade routes in his usual smug monotone, Brady was his typical flawless self, and Kraft was the same pompous jerk he is today. Now they are all losers, as are their arrogant fans. This may seem hard to believe, but the conventional wisdom this morning in Boston was that the Pats got robbed by the refs. That's right. With an offense that was called for one penalty - one - in three playoff games, the fans thought the officials were out to get the Patriots. Oh, please. When the final seconds ticked off the clock on Sunday, one of the first people I thought of was the late Sen. Arlen Specter, who was so convinced New England had cheated 13 years ago in Spygate that he called for a congressional hearing. Without the illegal videos of Eagles' practices, the Pats gave up 41 points on Sunday. Sen. Specter would have been delighted with that. And I thought of my co-host at WIP, Hollis Thomas, who still harbors bitterness over New England's cheating back then. Super Bowl XXXIX was his only chance to win a ring. Brian Dawkins, a new inductee to the Pro Football Hall of Fame, was a victim, too. That's probably why he said what he said after Sunday's win. "I couldn't have written a book and had an ending any more special than this," he said. "Hallelujah." Yes, indeed. It was a perfect ending for a 57-year quest by the Eagles and an equally ideal final chapter in the 18-year dynasty of the New England Patriots. In the end, they got what they deserved. As the exploits of the 2004-05 Eagles became relevant during the Super Bowl LII pregame conversation, three of the top players on that team had entirely different experiences over the weekend in Minneapolis. Of course, there was the great news that Brian Dawkins has been voted into the Pro Football Hall of Fame, an honor that was inevitable because of his extraordinary play and exemplary leadership. There is no Eagle, past or present, more beloved than Dawkins. Terrell Owens, whose reputation as an Eagle has improved with the passage of time, will join Dawkins in Canton next August, a tribute delayed two years only by his off-putting personality. He was one of the greatest receivers in NFL history, and he proved it with his heroic performance at the Super Bowl 13 years ago. And then there was Donovan McNabb, the biggest star for a decade in Philadelphia, including the Eagles teams that featured Dawkins and Owens. Despite his own campaigning, McNabb was not among the finalists for the Hall of Fame again this year. With each passing year, his candidacy is becoming more and more unlikely. Of course, because he is passive aggressive and insecure, McNabb felt obligated to piddle on T.O. 's parade on Saturday night when he tweeted his congratulations only to Dawkins, calling the iconic safety his "brotha and friend." McNabb made no mention of Owens, with whom he feuded after the Super Bowl in 2005. First of all, McNabb's comments about anything are immaterial these days, with him having lost three national broadcasting jobs - two because of DUIs and a third, most recently, amid sexual harassment allegations. Apparently, his status as a nonentity before Super Bowl LII didn't register with him. And secondly, there is no greater honor than induction into the Hall of Fame. Shame on McNabb for trying to ruin Owens' moment with his typically gutless and tired act. Clearly, all of the recent adversity has humbled McNabb not at all. The sad truth is, if McNabb had performed as well as Owens in Super Bowl XXXIX - instead of choking, literally, in the final 10 minutes - the quarterback probably would be standing next to Dawkins and T.O. on the dais in Canton next summer. He will not be there then, or - we can only hope - anytime after that. Donovan McNabb is not worthy of the Hall of Fame. He proved it again over the weekend. • Now that the Eagles' season is finally over, sports fans will turn their attention to our other pro teams. Ugh. The Sixers are not ready to contend, the Flyers are annual underachievers, and the Phils have two interesting figures, manager Gabe Kapler and stud slugger Rhys Hoskins. The rest? Meh. Something tells me the next few months (until Eagles' training camp) are going to be extremely anti-climactic. • If there was still any lingering doubt that Howie Roseman's reconstruction of the Eagles' roster was fueled by his dislike of Chip Kelly, it ended with the news last week that the Eagles' GM tried to reacquire Buffalo running back LeSean McCoy. The Bills rejected Roseman's offer, but it proves Roseman still harbors resentment over Kelly's power play three years ago, when the ex-coach stupidly traded McCoy for Kiko Alonso. • Markelle Fultz was steamed at Brett Brown last week when the Sixers coach said his No. 1 draft pick's shooting problems were "psychosomatic." What was Brown supposed to do, lie? The video of Fultz hoisting up free throws like a shot-putter was tangible evidence that he has a mental block right now. Fultz is not going to fix the problem until he admits it. Bravo to Brown for starting the process. • Post-season honors in all sports are a complete waste of time. That statement was proven true again over the weekend when Sean McVay was named coach of the year. Granted, the Rams' boss had a great year, but nowhere close to the season Doug Pederson had with the Eagles. McVay finished with 35 votes for his 11-5 season, while the Eagles coach got – ready for this – one vote from the Associated Press after a 13-3 record. Voting for these honors is like trying to review a movie before you use how it ends. It doesn't work. • I love Kevin Hart, but he really needs to show some appreciation for the fans of his home city of Philadelphia. The star comic had the audacity to apologize during a show in Minneapolis on Saturday night for the way we treated the Vikings' fans here during the NFC championship weekend. Ninety-nine percent of the Eagles fans were courteous and respectful. The last thing we need is Kevin Hart trying to win a few cheap cheers at our expense. Shut up, Kevin.